Click here for audio of Episode 1385. Today, a new look at a Colonial technology. The University of Houston's College of Engineering presents this series about the machines that make our civilization run, and the people whose ingenuity created them. Historian Alex Roland suggests that colonial inventiveness was not exactly as we often represent it. He begins by directing our attention to Bushnell's invention of the submarine. Bushnell was one of our most famous Colonial inventors. In 1776 he built a one-man, hand-crank-powered submarine called the Turtle. Bushnell enlisted a soldier to take the Turtle under the British ship Eagle and plant a charge. Once there, the man couldn't anchor the charge to the copper-clad hull. It exploded harmlessly in open water. But the potential of the new weapon was clear enough. But said the earth had quaked. Ran through the streets half-naked. Bushnell has ever since been hailed as the father of the submarine and as a great American technological genius. But Roland points out that the Colonies were well-informed about European technology. 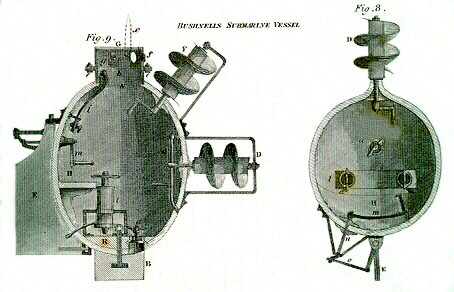 Bushnell worked on the Turtle at Yale University, and in the Yale Library was the English Gentleman's Magazine. That was a kind of 18th-century Scientific American. I've looked at the 1747 volume of the Gentleman's Magazine, and, sure enough, there's a short article with sketches of European ideas as to how a submarine might be built. It shows all the essential features of Bushnell's Turtle . It becomes easy to embroider this theme. American successes with the steamboat, the electric light, the telephone and the telegraph -- they all followed European inventions of those technologies. Roland argues, and most historians agree, that the United States didn't actually originate significant major new technologies until the twentieth century. Yet Americans put flesh and blood on those skeletal ideas. Bushnell was first to put a man under water in combat. The confident go-and-do-it mentality of Colonial and 19th-century America was infused with a different kind of inventiveness. It carried its own component of genius. Lately we've seen this drama replayed. Just after WW-II, we sneered at Japan for making second-rate copies of our technologies. By the 1980s we were asking how on earth they developed Western inventions so rapidly and so well. Now original new ideas are coming out of Japan. I hope we've caught on to the need for regaining that raw, driving, adaptive Colonial mind in our modern technologies. We must, of course, if we don't want to see the twilight of American technical greatness. Abbot, H. L., Beginning of Modern Submarine Warfare. (facsimile of an 1881 pamphlet, Frank Anderson, ed.) Hamden, CT: Archon Books, 1966. Roland, A., Bushnell's Submarine: American Original or European Import?, Technology and Culture, Vol. 18, No. 2, April 1977, pp. 157-174.
taken from a sketch by Denis Papin based on a design by the Dutch/English scientist Cornelius Drebbel. Note added August 7, 2017: Wikipedia now has an excellent article about Busnell's Turtle which includes this scale model of the machine.